Cupcake Wars - I'm The Chef Too! Prepare for war…cupcake style! Children will mix, bake, design and create one of a kind cupcakes in teams. They will learn techniques and choose from a variety of colors, flavors, and candies to make delicious cupcakes. All creations are then sampled by our panel of judges who rate them in terms of creativity, taste, and appearance. It’s time to get your bake on! Interested in this theme? Contact us! I’m The Chef Too! is locally owned and operated in Ellicott City, MD. It was created by classroom teachers whose goal is to combine the love of cooking and infuse it with educational concepts in the kitchen. 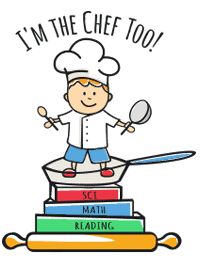 We strive to transform common core standards into delicious recipes, making cooking and learning fun, engaging, and tasty!